In 2007 the world had seen the movie ‘Always say yes’ with Jim Carey in the main role. But it is about the protagonist named Karl. At the beginning of the film Karl is shown as the loser, who has been left by his girlfriend and who isolated himself from all the world: he refuses all proposals, avoids meetings with friends. He is a typical hermit – "Mister No" that shut himself in his little world. At one moment, there was a sharp breakage in his life. On the advice of a friend he happened to visit one seminar after which he entered a new phase of life. He understands that he needs to say "Yes" to all possibilities. So, he begins to be guided by this principle in all life situations. First, he got the euphoria of novelty, but then it was replaced by the realization that he has become a hostage of this one simple rule. He could not refuse anybody. You will agree that to say "yes" is much easier than to say "no". Even to get a positive response feels much better than rejection. That is why today's post focuses on how to say "no". If you easily say this magic word – our congratulations. Then it makes no sense for you to read this post. But if you meet difficulties by saying this, then read several techniques mentioned below. You should understand clearly your values in this life. So, what are your values and goals? They are the criteria that helps you to take difficult decisions. Your energy is a limited resource. Sometimes for the realization of this truth we have to pay a huge price. As often happens, we are afraid to offend others and that is why agree to all requests. What does happen next? Trying to keep all the promises you lose your strength. As a consequence, it turned out to be even worse – you was not able to keep promises. It's very simple - you clearly understand that the proposal is not valuable for you. For example, somebody calls you with the words "We found your phone number on the Internet. We are a company that is developing rapidly. Are you interested in the possibility of high additional income? ". If the answer to your question "What the company?" you get a standard answer "This is not a telephone conversation, let's meet and I will explain everything." this is the case when a firm "no" will save you from the headache. There are situations in our life that the offer might be interesting for you. However, through hard-headed look you realize that no matter how the proposed "cake" might be tasty, but you still have ‘much own food’ (business) on "dining" table. If the offer is really interesting, then offer an alternative "Currently I do not have time for it, but remind me in a week. Maybe, I will have time for this". Remember that "maybe" does not mean "yes". Again, you realize that you have been offered something that you are not sure you can cope with (no time, skills, desire). Ask someone from your circle of friends and acquaintances for whom this proposal might be interesting. Perhaps these two men in the near future will cooperate fruitfully. 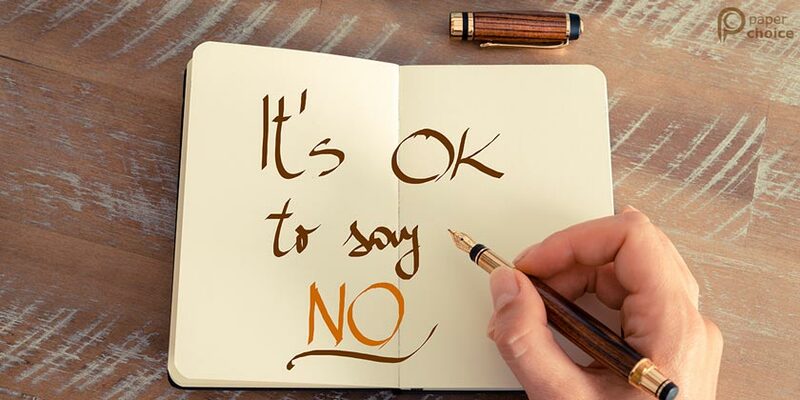 Remember that the ability to say "no" is, first of all, the ability to respect your own time.